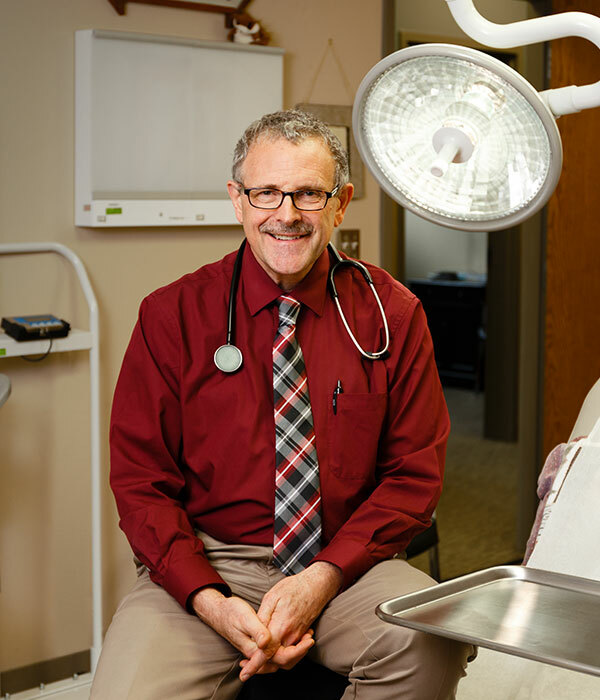 Dr. Steven Parnell created Fairmont’s independent Dulcimer Medical Center to give patients an integrative healthcare approach lacking in existing options. Dr. Steven Parnell shows off Dulcimer Medical Center like a proud homeowner giving a tour to a guest. Each room at the Fairmont, Minn., clinic has a title and distinct theme. This, he explains, keeps the clinic from seeming too, well, clinical. The Sports room features athletic equipment and memorabilia from local teams, including assorted red and white Fairmont homecoming buttons dating back to 1951 that a patient gave to Parnell. The Game room has board games hanging on the wall, including Operation and a Scrabble board with letter tiles spelling “Dulcimer” and “Health.” The Space room contains a mural of the solar system that patients can contemplate during IV infusions. Parnell stops to greet a patient leaving the Space room. He listens to her, silent and attentive, as she describes a health problem. Then he reassures with his calm, even voice that they’ll look into it to help her body balance out, to get its systems working in harmony. Since Dulcimer Medical Center opened in 2007, harmony has been the clinic’s guiding principle. The 35 employees see each other as family, and it helps that some of them are. Parnell’s wife, Donna, two of their four daughters and one son-in-law all work there. They aim for accord between the physicians, nurses, office staff, patients and treatments prescribed. Going beyond traditional allopathic medicine, Dulcimer uses a holistic-integrative approach to consider the patient’s emotional, mental and spiritual wellbeing on top of physical health. Each dimension of wellness affects the others, Parnell says. So stopping to pray for a patient’s emotional peace, whenever asked, sometimes has a greater effect than their prescription. This was part of what inspired Parnell to open Dulcimer. The clinic started with just one patient but now sees around 100 each day. It has collected just over 20,000 patient charts in the past 10 years, according to Business Office Manager Jill Irmiter. 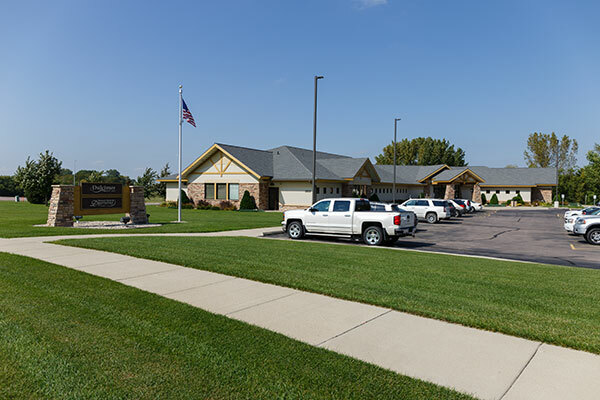 The clinic treats many residents in the Fairmont area, but it also has a regional draw with patients coming from Iowa, Illinois and the Dakotas. Parnell says he has seen patients who traveled from as far away as Georgia and Colorado. While Dulcimer is known for using an integrative approach, it does many other — and more traditional — procedures as well. Standing in one of the two minor procedure rooms, Parnell says the physicians do vasectomies and other small operations on site. He points out the crash cart in the corner, a large red toolbox with drawers full of medicine and devices to revive a patient who’s coding. “Hopefully, we don’t have to use that,” he says. Dulcimer performs electrocardiograms, ultrasounds, X-rays and pulse magnetic field therapy, a treatment the Vikings use on the sidelines to heal soft tissue injuries. The clinic offers a range of women’s health services, oftentimes in the Beach room (because if someone has to get a Pap smear, Parnell says, wouldn’t it be more relaxing on the beach?). The physicians screen patients for allergies and dementia, run blood work in the on-site lab to get faster results, and look at a patient’s genetics to understand how each body works. Above all, the staff strives to catch and treat problems early. However, it’s not easy for many elderly patients to visit health professionals for preventive care, so Dulcimer makes house calls. This is unusual in bigger systems, which expect patients to come to them, Parnell notes. But he has always done them, and he thinks it’s important to meet the patients where they are, whether for throat swabs, blood draws or simple checkups. The clinic also brings in a cardiologist, podiatrist and urologist, among other specialists, once a week. 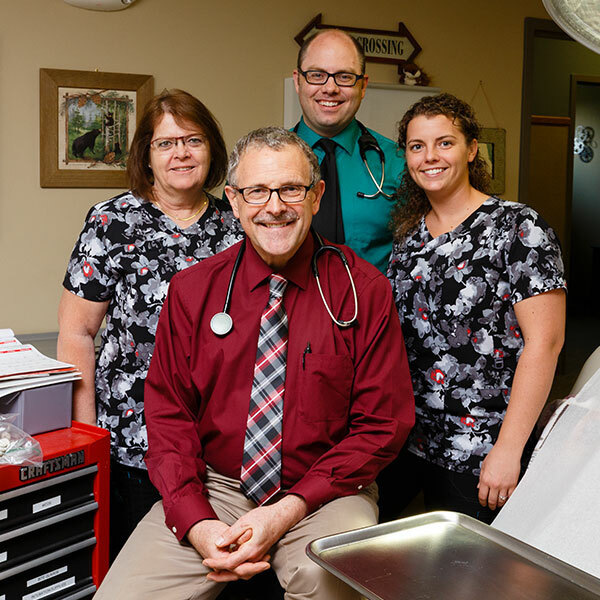 Parnell’s daughter Rebekah Boer, a nurse practitioner, drives from Lakeville, Minn., a few times each week to administer trigger-point injections for patients suffering musculoskeletal pain. Dr. Parnell with wife Donna, daughter Stephanie Schafer and son-in-law Nate Reyelts, P.A.. In Parnell’s office hangs a picture frame with several portraits of his family — on the beach, at one daughter’s wedding, having fun with grandkids. His four daughters and one son grew up in Fairmont, a much different experience from his. Parnell’s father was in the Air Force and then became a professor of broadcast journalism, so his family moved around, landing temporarily in Wisconsin and Colorado. They settled in Marshall, Minn., where Parnell went to high school and college — and where he fell in love. The romance blossomed, but his plans for the future remained unclear. Parnell studied chemistry and minored in music, but he didn’t know exactly what he wanted to do after graduation. He decided to become a doctor mainly because he wanted to put his science background to work helping people face to face, not be stuck in a lab by himself. However, he also chose medicine because his mother was a nurse, so he had an appreciation for medical professionals. His appreciation deepened after a car accident his freshman year of college. The Parnells were married in April 1978, and the newlyweds started life together in Rochester. Donna worked as a medical technologist specializing in mycology at Mayo Clinic and Steven studied to become a doctor at Mayo Medical School. When Parnell received a call about an opening at then Fairmont Medical Center, he and Donna moved south and started a family. He has been practicing in Fairmont for more than 30 years and is now delivering babies for women he delivered as babies. His and Donna’s daughters — Boer, Kellie Reyelts, Megan Christenson and Stephanie Schafer — have graduated from college and started careers and families of their own. 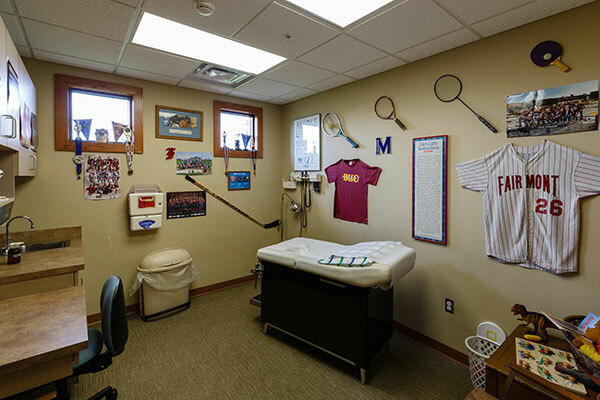 Each exam room features a different theme to put patients at ease, such as local sports team memorabilia for adolescent patients. For all of the Parnells’ joy, they’ve had their share of loss. In 2003, their son Tim Parnell died at the age of 22 while at college in Colorado. “He died in his sleep, probably of a heart arrhythmia,” Parnell says. Tim was a fan of Christian musician Rich Mullins, who played the hammered dulcimer. “We’d gone to a concert together, and Tim fell in love with the hammered dulcimer,” Parnell recalls. So they bought a dulcimer kit and together built the trapezoidal stringed instrument. The Parnells enjoyed hearing Tim practice and perform, swinging the small wooden mallets at the dulcimer strings. They never guessed the music would stop so soon. Tim had been interested in integrative medicine and encouraged his father to research it. So that’s what Parnell did when he decided to leave the local hospital a few years after Tim’s death. Mayo Clinic had taken over Fairmont Medical Center, and over time Parnell was ready to move on. Because of a non-compete agreement, he could not practice medicine in Fairmont for one year. But he couldn’t move away either. He had roots and patients and a son who was buried there. So he used that year to travel to integrative practices and learn new treatments. Parnell knew what kind of clinic he wanted to open but didn’t know what to name it. “We really wanted something that would symbolize our core value of harmony and would be enduring,” he says. A friend who remembered hearing Tim play the hammered dulcimer suggested naming it after the instrument, and it just seemed to fit. Dulcimer Medical Center rented an office, then quickly outgrew it. “We were practically at the point of having to see people in the restroom because we were running out of space,” Parnell says. He’d see patients all day, then pour over blueprints all night. The new facility needed to be environmentally friendly, but it also needed to be safe, not built with construction materials that would off-gas toxic chemicals. Banks considered it “a leap of faith” to finance the building. After all, there had never been a Dulcimer Medical Center before, and the clinic would have to compete for patients against the area’s Mayo-run hospital. Here in the land of Mayo, operating an independent primary care practice is uncommon. Minnesota ranks 42nd in the nation for the number of private providers, with just 23 percent of physicians identifying as independent, according to a 2015 article from the American Academy of Family Physicians. Because paying for holistic treatment has always been tricky, it ended up shielding the clinic from the worst effects of the MNsure change. “We were very concerned this would have a greater impact than it has,” Irmiter says. Going forward, Parnell plans to grow Dulcimer’s practice while keeping the focus on the individual patients. He constantly researches new treatments that promise even better results, prescribing them based on each person’s unique situation and genetic makeup. “There are no two patients that are exactly alike — even identical twins, believe it or not. Although they share DNA, they can be very different in how they respond to things,” he says. His office, with its large, full bookshelves and stacks of paper atop the file cabinet, resembles an academic’s. He searches for a diagram of the methylation cycle, then uses it to give examples of how one small mutation can throw a body into discord. The research is always changing, he says, which creates new ways to restore harmony. Acid reflux commercials make it seem like everyone should take a pill to rid their stomachs of acid. But one pharmaceutical’s side effects often lead to another, making people “ill to the pill,” Dr. Parnell says. Stomach acid is crucial for digestion. It kills off bad bacteria, so an acid deficit creates a risk for illness. It also breaks down protein into amino acids, one of which produces the mood-controlling chemical serotonin. “So you go on a stomach pill. Now you’re not digesting your proteins well. You drop your serotonin levels. Now you get depressed, so you get put on an antidepressant,” he says. Sometimes the problem is not having enough acid, especially in older people. So Parnell prescribes supplements, such as betaine hydrochloride, to adjust the pH level of some patients’ stomach acids. “Suddenly, you get better muscle strength, better cognitive function, and that sort of thing,” he says. Physicians across the U.S. who either own or are partners at a practice fell from nearly half of all physicians in 2012 to just 33 percent in 2016, according to the The Physicians Foundation’s “2016 Survey of America’s Physicians: Practice Patterns and Perspectives.” The number of physicians employed by hospitals or large medical groups rose from about 44 to 58 percent over the same period. “Many physicians are transitioning from private practice to employed settings with hospitals or other facilities in order to find a safe harbor … at a time when physician reimbursement models are in flux and private practice physicians are unsure of how they will be paid or whether they can cover private practice expenses,” the survey reports. Testing patients’ genetics has become much easier and less expensive in recent years. For a small fee, many web-based companies, such as 23andMe and Ancestry.com, will send out a test kit that users return to get the results of their 23 pairs of chromosomes. These websites provide users with interesting information, such as where their forebears came from, but Parnell goes beneath the summary. He downloads the raw data to see how a patient’s body works. His personal results show a high caffeine metabolization rate and an aversion to dairy.